A rendering of the Broadway Jones apartment project as seen from the corner of Jones Avenue and Avenue B. NRP GROUP / SAN ANTONIO HOUSING TRUST PUBLIC FACILITY CORP.
For the much-anticipated and much-discussed Broadway Jones apartments, developer NRP Group has agreed to an incentive deal that will provide 10 percent of the project’s 283 units to households making between 50 and 60 percent of the area median income (AMI), or between $33,400 and $40,800, respectively. The discount only applies to one-bedroom apartments. For example, a household making $33,400 would pay $835 a month for a one-bedroom apartment at Broadway Jones, based on the agreement. Under the deal, a tenant would be charged 30 percent of their income, a rent restriction intended to make these units truly affordable. However, NRP Group—which is the developer, the builder and the management company for Broadway Jones—has the ability to charge up to 35 percent of a tenant’s income. On Wednesday, the deal was solidified between NRP Group and the San Antonio Housing Trust Public Facility Corp. (PFC), a city-created nonprofit run by the City Council members who represent Districts 1-5. NRP Group, the PFC and an undisclosed equity provider, are partnering with an undisclosed bank to make Broadway Jones happen. The development partnership is exempt from paying all property taxes because the PFC also owns the property and everything built on it. In exchange for the tax exemption, NRP Group must offer half of the 283 units at Broadway Jones to people making 80 percent AMI, according to state law. NRP Group will rent the other half at market-rate prices. But many observers, including Mayor Ron Nirenberg, have recently questioned whether a typical San Antonio household making 80 percent AMI—or, $53,440—should be described as low income. Others on the City Council agree. And it was from Council discussions in the past month that NRP Group decided to take its agreement with the PFC a step further and add 10 percent of the units, or 28 apartments (taken from the half that’s offered at 80 percent AMI) and offer them to people in the 50 to 60 percent AMI bracket. So what does NRP Group get in return? By offering rents to people making between 50 and 60 percent AMI, NRP Group doesn’t pay the PFC’s closing fee of $250,000. Instead, those funds will be used to create a reserve that will “buy down” rents, i.e. make up the cost of making the apartments affordable. For example, a one-bedroom rented to someone making 80 percent AMI would cost $1,065 (based on the 30 percent rent restriction). For the person making 50 percent AMI, it would cost $835. The difference—or, $230—will be subsidized using the $250,000 reserve fund. In an interview a few weeks ago, Veronica Soto, director of the city’s Neighborhood and Housing Services Department, described the practice of “buying down” rents as an incentive. The agreement comes after much discussion among City Council members about the city’s role in incentivizing housing, especially in the downtown area. In light of San Antonio’s economic segregation, a handful on the Council said they must be able to convince their constituents that the public is receiving a worthwhile benefit in return for doling out tax breaks to developers. Cheaper apartments, especially in the downtown area, do that, they said. On Nov. 1, before voting on a reimbursement grant worth up to $680,000 from the Midtown Tax Increment Reinvestment Zone, the Council entered a candid discussion about what some members called a lack of affordability at Broadway Jones. At the time, the agreement between the PFC and NRP Group did not include 60 percent AMI rents—just half at 80 percent AMI, half at market rate. 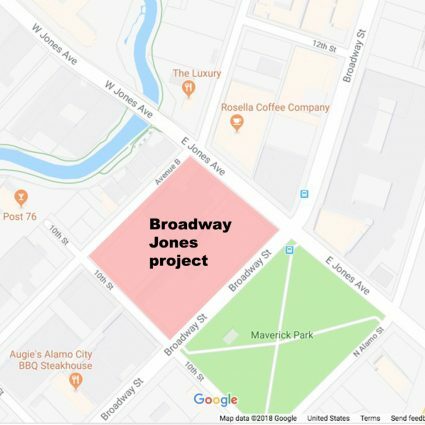 During the discussion, District 9 Councilman John Courage voted against the incentive for Broadway Jones because it didn’t offer apartments to people making below 80 percent AMI. On Wednesday, via text, Courage said he was encouraged to hear that the PFC and NRP Group found the means to incentivize more affordable units at Broadway Jones. “We need to keep our inner city and downtown neighborhoods affordable for all San Antonio working families,” Courage said. 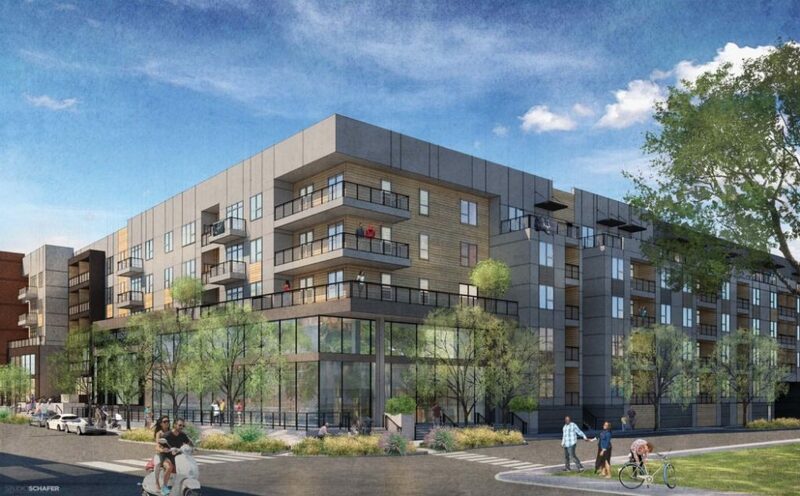 The $55.9 million, five-story, Broadway Jones apartments will add 283 mixed-income units to what is arguably San Antonio’s hottest real estate submarket—River North. It will also add roughly 15,000-square-feet of retail on two floors. Restaurants, most likely. This type of agreement between the PFC and NRP Group produced the Cevallos Lofts in Southtown, and the newer Baldwin apartments on the near East Side, to name a few. The PFC partners with other affordable housing builders, and most are built outside downtown. 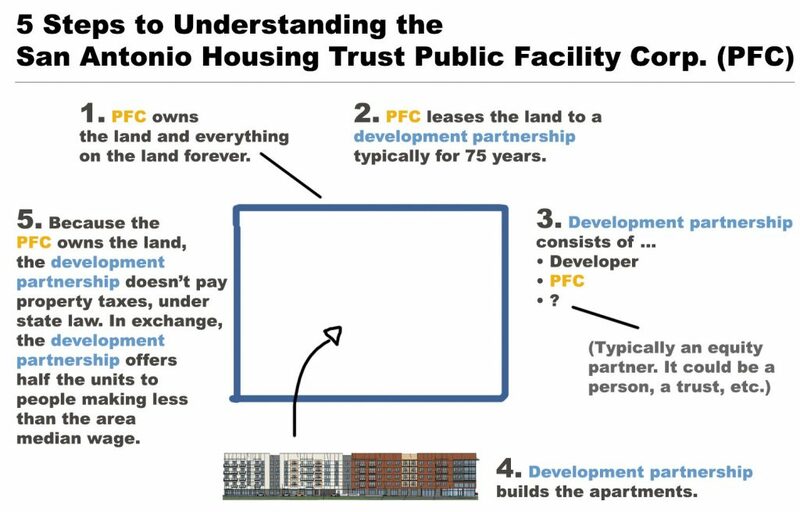 For example, for the Friedrich Lofts project on the East Side, the PFC is partnering with Dallas developer Provident Realty Advisors, Inc.
It’s the same type of agreement that’s resulting in The ’68 at Hemisfair, but that agreement is between AREA Real Estate and the Hemisfair Park Public Facility Corp. The San Antonio Housing Trust PFC’s board is composed of Council members representing Districts 1-5, who are, in district order: Roberto Treviño, William “Cruz” Shaw, Rebecca Viagran (chairwoman), Rey Saldaña and Shirley Gonzales. The PFC purchases the land and owns everything built on the land. The PFC forms a partnership with an apartment developer, and typically a third equity partner, and the partnership finds a lender, a bank, which then backs the project. The partnership leases the property from the PFC for 75 years, and it also constructs the building. At the end of the 75 years, the PFC owns the development outright. The PFC, in the case of Broadway Jones, owns 15 percent of the partnership without putting in any equity. It’s bringing to the table the tax exemption (the total value of which the PFC has not shared after requests from the Heron). However, for its 15 percent ownership, the PFC receives 15 percent of the rent revenue stream. It also receives an annual administrative fee from the developer, which is $20,000 a year for Broadway Jones, according to Soto. If NRP Group decided to charge full market-rate prices, or sell its partnership stake to another developer who then charged full market-rate, the development would lose its tax exemption. If this were to happen, the PFC would still have the right to own its 15 percent. In Broadway Jones, NRP Group is also an equity partner, though Travis Sheffield, NRP Group’s vice president of development, declined to say how much money the developer was putting into the project. When asked who the other equity partner was, and which bank was lending the rest of the funds, Sheffield said he would disclose those other players once NRP Group closes on the deal, which it’s scheduled to do on Dec. 14. When asked about the development’s projected rate of return on investment, Sheffield deferred to PFC attorney Jim Plummer with the law firm Bracewell LLP. Plummer told me he didn’t remember. The 2.6 acres is currently owned by developer James Lifshutz, which is selling the three combined properties for an unknown price to the PFC. Under the partnership agreement, Lifshutz will own and lease the retail portion of the building, and pay sales taxes. The three properties are valued at $5.7 million by the Bexar County Appraisal District. NRP Group hopes to break ground on Broadway Jones the first week of January, Sheffield said. Are the tax breaks necessary? At the Nov. 1 Council meeting, Sheffield and Assistant Manager Lori Houston told Council members that the full tax exemption offered by the PFC was necessary because the property, even though the land is arguable the most prime real estate in the downtown area, possesses a set of challenges unique to the location. PFC projects such as the Friedrich Lofts, which are replacing the decades-long vacant former Friedrich refrigerator factory, are said to be economic boosters of long-neglected neighborhoods. But the Broadway corridor is far from being ignored. It has seen a flurry of multifamily projects pop up since the creation of the city’s Center City Housing Incentive Policy (CCHIP) is 2012. Last year, voters approved the 2017-2022 bond program, the largest single item of which was $40 million toward Broadway street and sidewalk upgrades, right outside the front doors of Broadway Jones. It’s nearly equidistant from the Pearl and downtown proper, and is a quarter-block from the Museum Reach section of the San Antonio River. It’s also a short bike ride away from the gentrifying East Side. A city-funded assessment of CCHIP, which offers rebates on city property taxes alone, concluded that these types of projects—wood-framed, five-story apartment buildings along downtown’s outskirts—no longer required incentives to be successful, because the rents they’re able to command offer a large enough revenue stream that they are profitable without incentives. At Broadway Jones, environmental issues having to do with the removal of underground storage tanks, and the spacing out of utility poles, which is required in order for NRP Group to maximize the land, have added additional cost to the project, Sheffield said. In short, Sheffield said NRP Group could possibly build the apartments without the tax break, but the apartments wouldn’t be affordable. At the Nov. 1 meeting, District 6 Councilman Greg Brockhouse criticized Broadway Jones for only offering one-bedrooms to low-income households. Plummer said in future PFC deals, he’s telling developers they need to include 60 percent AMI rents across all bedroom types. The new direction in affordability seems to be the result of some strong feedback from Nirenberg, Courage, and, most notably, Saldaña, who has been beating the affordability drum for more than a year in regards to CCHIP and, now, the PFC. Thank you for this very informative and detailed srticle. It covered a number of viewpoints and nicely explained some of the terms that are often thrown around.